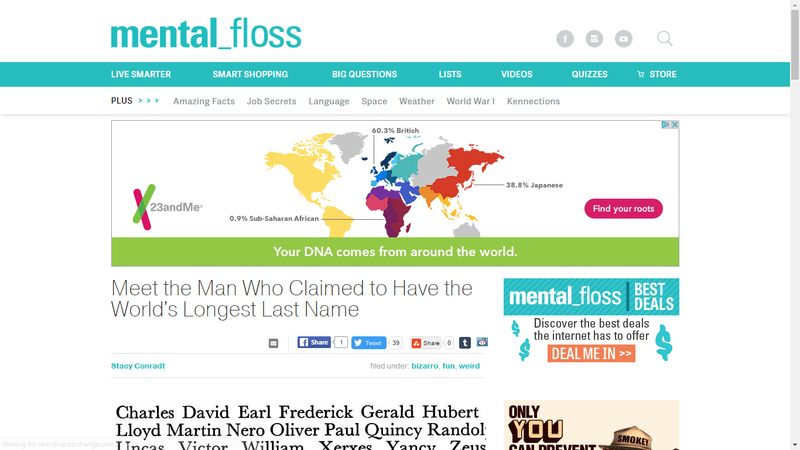 The mental_floss website has a fascinating article about the man with, ostensibly, the longest name - see Meet the Man Who Claimed to Have the World's Longest Last Name by Stacy Conradt. Adolph Blaine Charles David Earl Frederick Gerald Hubert Irvin John Kenneth Lloyd Martin Nero Oliver Paul Quincy Randolph Sherman Thomas Uncas Victor William Xerxes Yancy Zeus Wolfe­schlegel­stein­hausen­berger­dorff­welche­vor­altern­waren­gewissen­haft­schafers­wessen­schafe­waren­wohl­gepflege­und­sorg­faltig­keit­be­schutzen­vor­an­greifen­durch­ihr­raub­gierig­feinde­welche­vor­altern­zwolf­hundert­tausend­jah­res­voran­die­er­scheinen­von­der­erste­erde­mensch­der­raum­schiff­genacht­mit­tung­stein­und­sieben­iridium­elek­trisch­motors­ge­brauch­licht­als­sein­ur­sprung­von­kraft­ge­start­sein­lange­fahrt­hin­zwischen­stern­artig­raum­auf­der­suchen­nach­bar­schaft­der­stern­welche­ge­habt­be­wohn­bar­planeten­kreise­drehen­sich­und­wo­hin­der­neue­rasse­von­ver­stand­ig­mensch­lich­keit­konnte­fort­pflanzen­und­sicher­freuen­an­lebens­lang­lich­freude­und­ru­he­mit­nicht­ein­furcht­vor­an­greifen­vor­anderer­intelligent­ge­schopfs­von­hin­zwischen­stern­art­ig­raum, Senior. The article has several other long names for persons craving attention - read the entire article. My first thought was "how in the world could he remember that?" My second thought was "He wouldn't dare name his child that, would he?" Apparently, I was wrong about that. I like the abbreviation used in the article - his surname is Wolfe+585 (characters). I looked for him on Ancestry.com using the Wolfeschl* surname and didn't find him. Maybe he used only Wolfe. My "Übung des tages" (exercise of the day) in separating the German words was fairly accurate, and the subsequent cheat at Google Translate wasn't far off from Hubert's "loose translation."